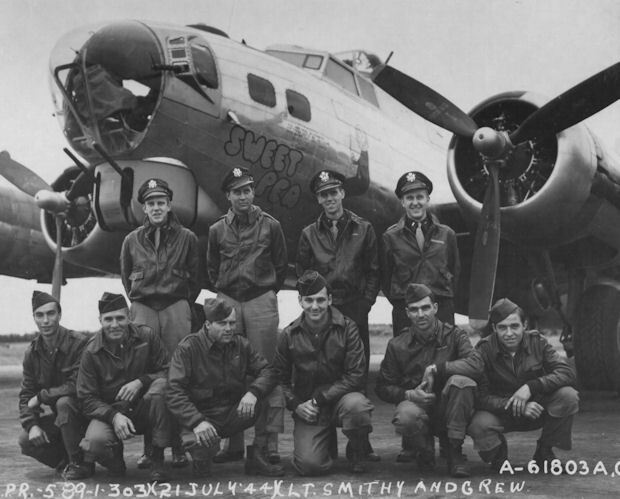 Mission 229 - 8/15/44 to Wiesbaden, Germany - Nine 303rd BG(H) B-17s lost. "Hell in the Heavens" was hit from the rear by German FW-190 fighters. 2Lt Smithy (P) tried to fly evasive action and then gave the bailout order and put his B-17 on automatic pilot. When fire was seen on the left wing, he bailed out. The CoPilot, 2Lt Boat, flew the B-17 for another ten minutes before bailing out himself. The fortress crashed and exploded in the Koblenz, Germany area near Wittlich, Germany. The five enlisted crewmen were killed and the officers became POWs, after successful parachute jumps. 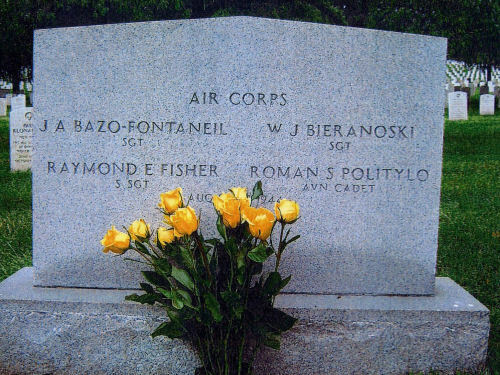 Sgt Juan A. Bazo-Fontaneil, Sgt Roman S. Politylo, Sgt Raymond E. Fisher and Sgt Walter J. Bieranoski were buried in a common grave in Adenau Community Cemetery, Adenau, Germany. In 1950 the four were returned to the USA and buried in Section 34 of Arlington National Cemetery, VA. The interment service, with full military honors, took place on Holy Thursday, April 6, 1950. 2Lt Robert J. Klein - Stood down on missions 214, 215 & 216 where substitute Toggliers were used.